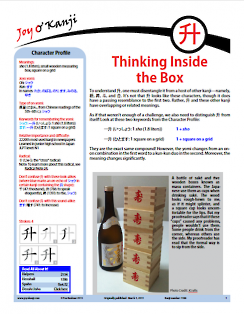 Find out why the Japanese drink saké out of small wooden boxes. Learn how their role has changed in Japan over time, and see how they have brought out the playfulness in designers. Learn when to interpret 升 as a unit of measurement or as a container, and distinguish 升 from 枡, 斗, 合, and 昇, which have overlapping meanings. Finally, see why 升 is popular in a Chinese context. By the way, the JOK Notebook entry for March 1, 2013, takes a close look at eight of the Japanese sentences that appear in this essay. Oct. 31, 2013: p. 1. Added 井 as a look-alike. Mar. 1, 2013: Originally published.